10th victory followed away from home for some intractable Warriors. Curry (26 points, 75% in triples) at a record pace from long distance. The Pacers are in the worst moment of the season. The confirmation of Oladipo's absence has ruined what was being a perfect year, in which they were relatively settled in third place and wanting to give a scare in the playoffs. Now they already feel the breath of Sixers and Celtics (finishing fifth would be a drama for them in the face of the post season), they came to lose in Memphis (where now anybody wins) and just in this unfavorable situation they get the visit of the Warriors . It would not have occurred to your worst enemy. A the champions, as they are, you have to receive them with all your weapons ready, hope that one of theirs does not work well and, after all that, pray. They are in steamroller mode, at that moment they have all the seasons (and several times) in which they would be favorites against almost any team in history. In Indiana they showed it again. The game served them fundamentally for two things: to confirm that Cousins has returned much better than expected and that Curry is unstoppable. The base was dedicated to destroy during the first part to his rival with baskets of all kinds, including 5 triples of 5 attempts. He finished with a 6/8 from the long distance, so that already adds 202 in the season. Although the Warriors have 49 games, he has only played 38. This makes him the first player in history to hit 200 three-pointers in less than 40 games. And, by the way, is his seventh consecutive season that reaches this figure, something that nobody had done either. As for Cousins, signed his best numbers since debuted: 22 + 6 + 4 in 25 minutes. It is true that the great difference in the score was good for him to play at ease in the last period, but he had already shown that he is ready to play at the highest level. And that gave a good scare in the first room. In an entrance to basket Myles Turner hugged him and made him fall to the ground very unbalanced with a very ugly position of his knee. He remained lying on the floor making gestures of pain, which created uncertainty and concern in those present. Luckily the thing came to nothing. 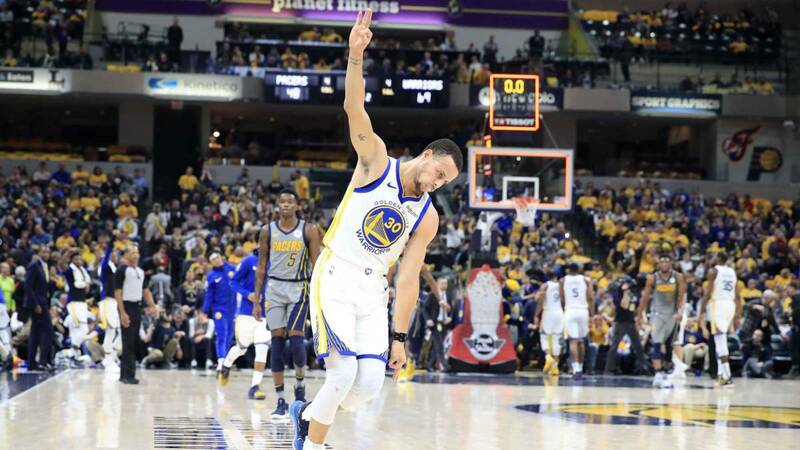 The Warriors are now home to play a series of three games that, a priori, should not be easy: Sixers, Lakers (maybe already with LeBron) and Spurs. But as they are, not even these rivals seem enough. Meanwhile they come back from the East after ravaging Indiana, sinking Boston's illusions and stifling Washington's rise. The final three steps of a streak of ten straight wins on the road, where they do not lose since they did in Salt Lake City on December 19.